On 29 January 2007 Sheffield City Council and the South Yorkshire Passenger Transport Executive (SYPTE) signed the First Statutory Quality Partnership Scheme to be made in England under the powers given by the Transport Act 2000.The Statutory Quality Partnership Scheme for North Sheffield (Barnsley Road) will bring significant improvements to the quality of bus services in this part of South Yorkshire. The scheme includes measures concerning infrastructure such as a new bus lane on Burngreave Road, improvement of bus stops, better information including real time display and new traffic detection technology. In return minimum standards are required of bus fleet (low floor and low emissions, on-board cameras for passenger safety) and qualification for all drivers. More than 14 million bus passenger journeys are made annually and raising the quality is expected to offer an attractive alternative to the private car for some journeys. 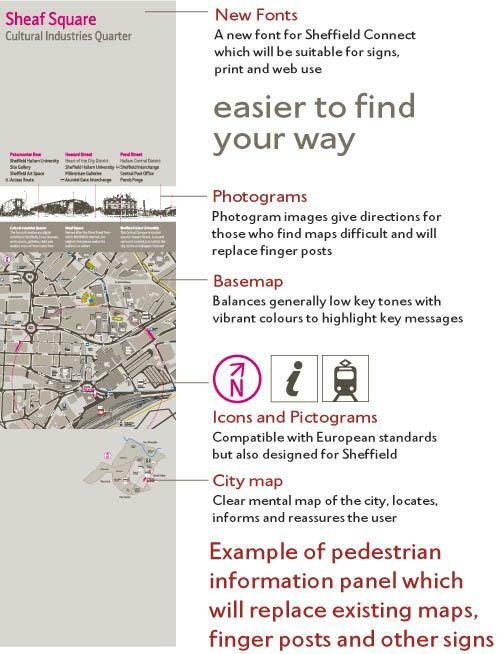 Connect Sheffield: First Integrated Wayfinding System linking public and private transport and pedestrian information has been launched in the city centre. The project is part of the Transport Masterplan for Sheffield city centre it addresses all modes of transport and aims to provide legible, accurate, frequent and consistent travel information to ensure people can navigate themselves and have a real travel choice. The first phase focuses on pedestrians and bus and tram passengers. It consists of a series of pedestrian Information Points (PIPs) located at regular interval along pedestrian routes and are useable by people with disabilities. Location maps and photograph of the immediate surroundings, along with relevant information associated with the area are provided at each PIP. The new Connect style is also applied to the bus shelters including flags to emphasise the identity of the project and reinforce integration and consistency. Information provided includes network/route maps, timetable and real time information at selected places. The second phase will include a Variable Messaging System giving information on available parking spaces and traffic congestion conditions. Geared towards motorists, VMS will help in making choices in combination with the use of public transport.